Vision therapy, an innovative treatment program that improves the way your eyes and brain work together, traces its roots to the beginning of the 19th century. Although early treatments were created to correct strabismus (crossed eyes), eye doctors soon theorized that improving the eye-brain connection would offer even more ways to help patients enjoy full use of their vision. Most people associate crossed eyes with strabismus, but the condition can also cause the eyes to turn outward or result in one eye that's higher than the other. Strabismus causes a variety of symptoms that affect vision, including blurred or double vision, poor depth perception, eyestrain, and headaches. Children who have the condition often find school work challenging and may quickly fall behind their peers. In the early part of the 19th century, surgery was the only way to correct strabismus. Although surgery was effective and is still used today in some cases, eye doctors thought that there might be an easier way to re-align the eyes. They asked patients to view images through a stereoscope, a device that places a slightly different version of the same image in front of each eye. When the images are viewed together, the brain combines them to form one three-dimensional image. Optometrists discovered that regular use of the stereoscope gradually realigned their patients' eyes, eliminating the need for surgery. For years, optometrists were intrigued by the possibilities of improving vision with therapies designed to enhance the interaction between muscles, eyes and the brain. 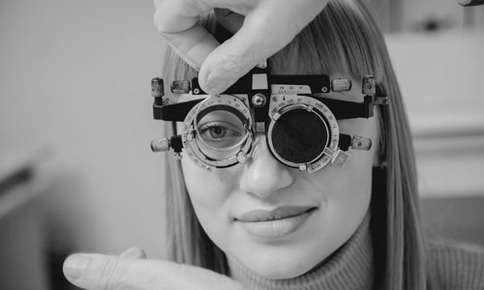 Although individual eye doctors conducted their own research into the topic, it wasn't until the formation of the College of Optometrists in Vision Development (COVD) in 1971 that vision therapy became a formal treatment option. Since then, the college has certified thousands of optometrists and vision therapists and offered information to the public about the many benefits of the therapy. Although the benefits of vision therapy in children were quickly evident, it was originally thought that the games, exercises, and activities used in therapy would have no effect on vision in adults. Because visual pathways form completely by age 8 or 9, it seemed inconceivable that therapy could have a positive effect on vision in teens and adults. Fortunately, that wasn't the case. A 2005 National Eye Institute Study discovered that therapy improved vision for teenagers with amblyopia (lazy eye), while a 2013 the University of California at Berkeley study concluded that visual acuity improved in adults with amblyopia who spent 40 hours playing video games designed to address the condition. Neurologist Oliver Sacks explored the benefits of vision therapy for adults with amblyopia in a June 2006 New Yorker article that followed the case of Sue Barry, known as "Stereo Sue." Sue had surgery as a child to correct her misaligned eyes, but by that point, she had also developed amblyopia. Amblyopia occurs when the brain ignores the images sent from one of the eyes. Sue realized that something wasn't quite right with her vision, but doctors told her that it was too late to improve her binocular vision. When she reached her 40s, Sue's vision problems worsened. Suddenly, it was difficult to see objects in the distance or read her notes when she taught classes. Everything seemed to shimmer, and eye fatigue was a constant problem. After a visit to a vision therapist, Sue was fitted with eyeglasses that contained prisms. The prisms shifted her visual field, making it easier for her eyes to work together. She also participated in vision therapy activities used to improve binocular vision, such as Brock string exercises. During the Brock string exercise, one end of a string is attached to a stationary object while the patient holds the other end against his or her nose. Alternating focus between three beads placed at various points on the string forces the eyes to work together as a team. At the conclusion of vision therapy, Sue's depth perception improved dramatically, and she could finally see objects in three dimensions. Her case is an important reminder that it's never too late to benefit from vision therapy. Do you have difficulty reading or driving, or do you experience frequent eyestrain or headaches? You may have a vision condition that can be easily corrected or improved with vision therapy. Contact us to schedule a comprehensive eye examination that will determine if you can benefit from vision therapy.